Since the dawn of time, trees have been part of the human life; not only of the human, but also of animal life, and the life of the planet. It’s not really so hard to think that without trees life would be terminated at the blink of the eye. Just why are trees important? Read on and find out the importance of trees. When making their own food, trees absorb free pollutants in the air. It is also during this process that trees absorb carbon dioxide—the gas we exhale and the gas responsible for global warming—and releases oxygen in return. This is why I was saying we’d be terminated without trees. Humans need oxygen, that’s a fact. The number one producer of oxygen in history is tree. When trees process their own food, oxygen is released during the process and is thus consumed by animals and humans. A single mature tree can produce as much oxygen in 4 months as two families consume for a year. Without trees we’d all be inhaling what we have just exhaled. Ever wondered why it’s cooler under a tree? It’s because there’s more oxygen in a nearby tree than anywhere else. Trees play a great role in lessening summer’s devastating heat. Studies show that a city area without a tree is a ‘heat island’—with temperature 12 degrees Fahrenheit higher than other areas. Another benefit from trees is that is can actually clean soil & water around their area. When fuels and other harmful chemicals contaminate soil and water, cleaning it up can be expensive and intensive. Recent studies show, however, that trees can clean up fuel-contaminated soil and water through a bioremediation called phytoremediation (fancy word, huh?). Trees can store pollutants for their own use, or they can change the pollutants into less harmful forms. In the process of absorbing water, some contaminants will be degraded by the trees for their own use. Trees can also degrade animal wastes into fertilizers for their own consumption. Believe it or not, trees can dull noise pollution as good as stone walls. Plus, don’t you think the sound of rustling leaves sound relaxing and revitalizing? When it rains hard vegetation—not only trees—play a great role in preventing floods. First, the roots of vegetations keep soil intact, preventing erosion. When vegetation is also present, surface movement of rainwater is slowed down, giving water time to be absorbed into the soil. If a stream cannot hold water, water will simply rise above its banks and flood. Trees prevent this by intercepting water flow to rivers. And that is one of the many advantages of planting trees. A certain tree can intercept a thousand gallon of water when fully grown. On windy and winter seasons, trees can act as windbreaks. A windbreak can lower home heating bills, and have an effect on reducing snow drifts. A reduction in drying soil & vegetation can be lessened by windbreaks. And last but definitely not the least reason why trees are important . . . Well, trees increase the property value of your home by 15% (or depending where you live). So if you are planning to sell your house, it’s a good thing that you have kept a tree. Trees are the integral part of our life. Without trees we can’t even think about life on earth. Every human being need to plant a tree and care for it until it grow properly. Public awareness must be there in every big city to save our environment. Day by day our environment is getting polluted because of several reasons and pollution is occurring because of humans only. The solution of this problem is in our hands. If we will plant more trees and if we will take care of our environment then only we can save it from getting polluted. Trees are nature’s beauty and people are cutting it day by day which is not good at all. As we all know, trees play a major role in filtering the impure air and convert it into the pure air so that humans can inhale the oxygen and can stay away from many types of diseases. We humans are forgetting the importance of trees and using them for our means and hurting the environment. Trees also filter the rainwater and remove all the impurities of it by performing a slow process. Trees give us spices, fruits and medicines which are used in various forms. Trees provide shelter to animals when it rains heavily and the forest department always takes care of trees. Trees also keep the atmosphere and air clean and provides cool to the streets and the city. You must have noticed that whenever you go to a place surrounded by a lot of trees, you find that place chill compared to other places. Trees also conserve energy in various forms. If your house is surrounded by trees, then you must have felt the pure air coming through the windows, this way it cuts down your electricity expenses especially in summer. You also get a lot of fresh air in your house, keeping you and your family healthy. Trees provide us fruits and food. As I already mentioned above, trees provide us spices which we use in cooking. Fruits are a good source of nutrients and vitamins. Thousands of products like paper, furniture, books, hockey sticks and many more things used in our day to day life are made from wood obtained from trees. The wood of trees plays an important role in making houses and buildings in big cities. Though, this is the main reason humans are cutting too many trees and forests and causing the disasters like global warming. So, there must be some regulations in place to control the cutting of trees. More green reservoirs should be made to maintain the balance of nature. Without trees we are nothing and we can’t survive on this planet because trees provide us so many things which are required to survive. It is the duty of everyone to plant a tree near your house, school and college to keep the environment clean and safe. If everyone starts planting at least one tree, there will be millions of new trees within few years. Millions of people die every year because of pollution. It harms us in the long run and causes a lot of life threatening diseases. If the environment is clean, we can eliminate a lot of diseases which are caused because of pollution. Thus, trees play a very important role in our lives. Trees are our best friend. Due to trees, we get fresh air. We get many things such as food, medicines and many other things. Trees are very important in our life.Without 🌲 we can not live in this planet trees fresh air,soil,water,trees also absorb heat. 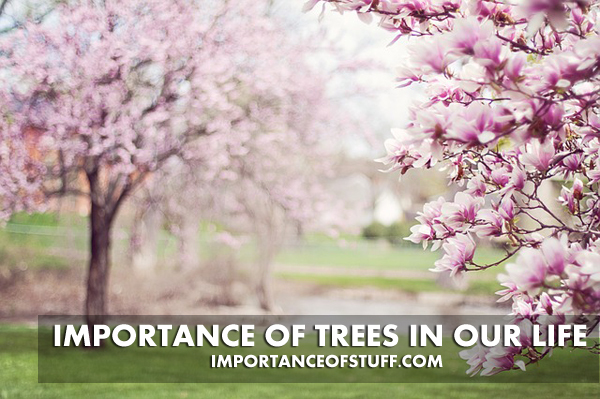 Trees are very important in our everyday life. We cannot think of our existence without trees. Trees are also our best friend. — Its a nice post. Thank you.